If you or someone you know has experienced human trafficking or is in a potential human trafficking situation – call them. They can connect you with help and services. If you have information on a potential trafficking situation, they want to hear from you. If you are interested in learning more about human trafficking, or would like to request training or technical assistance – call them. Your call could help get victims of human trafficking out of exploitative and dangerous situations and into safety. 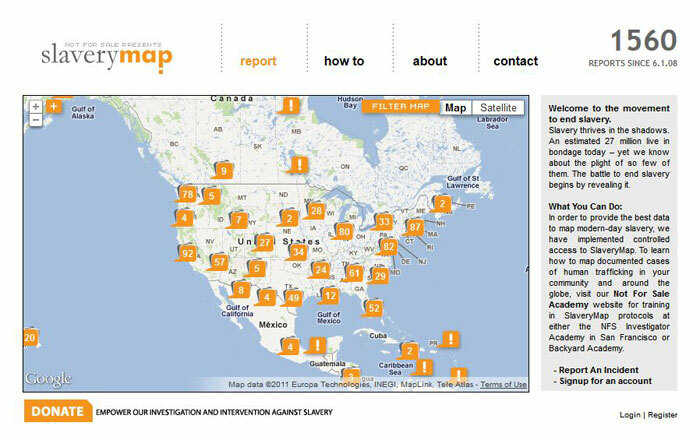 Slavery Map by the Not For Sale Campaign is an interactive map that shows reported locations of slavery incidents and allows you to report a slavery situation. Click on the map below to go to the Slavery Map website.